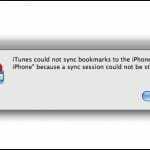 As previously noted, several users have reported an issue in which the iPad, iPhone and iPod touch become indefinitely stuck on the backup phase of syncing. Other users report that the backup process is inordinately slow, taking up to 3 hours in some cases. 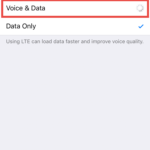 We previously noted a number of fixes for this problem, including disabling the network connection after the sync process has begun, restoring instead of updating, switching USB ports and more. As an alternative, you can disable the backup process entirely using a tool such as BackOff. This utility allows you to easily toggle the automatic backup function on and off. Note that you should still occasionally backup your iOS device to protect its data. This utility will, however, allow you to perform routine syncs without the delay of a backup. 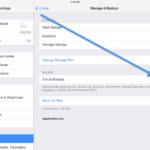 if you want to turn off auto backup option in your iPhone, then you can. But before doing you should create a proper backup copy of your all important data that helps you to restore your lost data whenever you faces data loss situations in your iPhone. Like to perform iPhone video recovery you must have to update the backup of your iPHone videos. Worked great, just as advertised. I have an old iPhone 3G running 3.0 and I was trying to update to 4.2 but the backup would run for hours and make little to no progress. The DiskAid backup disable feature caused iTunes to come up with an error trying to backup and asked me if I wanted to continue anyway. NOTE: Keep in mind that if you’re doing an upgrade like I did you will lose EVERYTHING. It’s essentially a clean wipe of your phone. Recordings, text messages, pictures, notes, etc. You’re formatting your phone and installing a new OS on a clean slate if you don’t do the backup / restore portion of the upgrade. Not sure why everyone keeps recommending BackOff? I tried it, several times, and It does nothing. I am still required to backup my iPad before updating to ios5. This backup/update has been a nightmare. Almost as burdensome as using the Apple TV device. Same problem here. I’ve tried BackOff and it’s been useless so far. Perhaps the iTunes update disabled its abilities? If true, that’s a shame. I’ve been a Mac user since 2005, telling people how great it’s been to not waste hours with operating-system problems like would frequently happen during my years using Windows. Anyone know how to have the backup go directly to an external drive? I don’t have space on my laptop to back up everything that’s on my ipad. I’d rather not have to delete items from my ipad for any update. Back Off leaves the back up on and steals your data. I just upgraded my ipad to 4.2.1. I got good news, my backup used to take 24+ hours to finish now only took about 3 mins. I checked the backup files and Apple now used the iphone type to do the backup, not the other mdinfo type. So Apple did realize they did something wrong and correct it. turning off the backup is a partial solution; Ill sync fast, yes, but Im not backing up, so if I loose the data is lost forever. 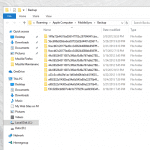 Apple should fix this and let us backup, and fast, as with any device. Thank you, thank you, thank you. Works perfectly. for the November 2010 iPad update- this worked perfect. Thank you! Thank you! BackOff did the job. IT Works! it was taken over 8 hours to backup and sync my IPAD, now it takes less than 2 mins to Sync! Thank you! Works as advertised. From 3+ hours of doing nothing (backing up ipad which has almost nothing on it), to minute to sync. The other tip I read about and did was to reset the warnings. 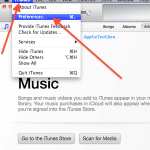 When you device is connected, right-click on the device in iTunes and select “Reset Warnings”. This clears a potentially large backlog of warnings that iTunes apparently tries to send to Apple during a backup and this can cause delays or hang. Wow, no comments yet? I was having terrible trouble with backups taking over 12 hours. Other forums and blogs mentioned removing all of your apps and pretty much doing a full reset. I was like…”NO WAY! I am not deleting all of my app data” And even if I did, I couldn’t get through the backup to do the sync. But I did remove my most recent apps which may have been causing the problem, and also some games which had sizable save data. Then I used the BackOff tool to turn off backups. I then did a sync and the problem seems to have gone away. I was able to turn backups back on and they take only a few minutes now. I have a 1st gen iphone and sync with a PC. Everyone should know about this fix.